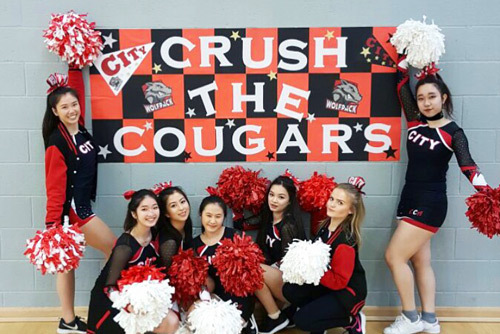 Sports teams from City, University of London and Kingston University have taken part in a series of matches this week, as part of the first ever City vs Kingston Varsity. Team City, also known as ‘The City Wolf Pack’ were victorious, winning seven of the thirteen matches, against the ‘Kingston Cougars’. They took home the 2017 Thames Trophy. The trophy will stay with the winning university each year and is currently displayed in the trophy cabinet at CitySport. Students competed in nine different sports during the two-day event, including badminton, volleyball, basketball, squash, hockey, tennis, football, netball and rugby. There was also a performance from the City Bhangra Society. Team City’s mascot, City Wolf was present during Varsity to cheer on the City Wolfpack. Spectators were invited to support the teams at matches held at both CitySport and Kingston University. Hundreds of supporters turned out to watch the matches that were also streamed live in CityBar. Spectators were also given the opportunity to try out some fun and unusual sports including zorb football, ultimate frisbee and gaelic football. An after party was held at CityBar. A Varsity is a series of sporting fixture between two local or rival universities. The oldest Varsity match in the world is in cricket between the University of Oxford and the University of Cambridge, having first been played in 1827.